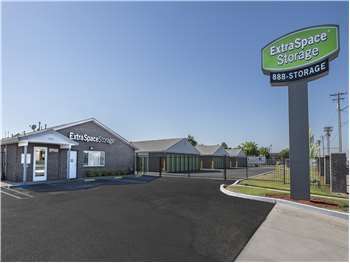 Located near the intersection of Crows Landing Rd and Whitmore Ave, Extra Space Storage serves Modesto residents near Bret Harte, Harp, Ceres, Shackelford, Bystrom, West Modesto, Riverdale Park, and more. Locals will recognize our facility next to ARCO gas station near Jack in the Box. Extra Space Storage on Crows Landing Rd offers a variety of storage units, vehicle storage, and exceptional security, making us your go-to partner for Modesto self storage! With units ranging from 5x5 to 20x30, Extra Space Storage in Modesto can accommodate items large and small. We also have convenient storage features, such as drive-up access and outdoor vehicle parking. The safety of our customers and their belongings is a top priority for us. That's why our Modesto storage facility has an on-site resident manager, 24-hour video surveillance, and electronic gate access. Looking for vehicle storage in Modesto? Our Crows Landing Rd storage facility has the options you want! With 10x25 to 10x50 outdoor parking spaces and 10x20 to 20x30 enclosed drive-up units, it's easy to store cars, motorcycles, trailers, campers, RVs, and boats. Extra Space Storage provides dependable self storage with exceptional service. Our facility is always well-maintained, clean, and backed by a friendly, professional team of self storage experts who genuinely care about delivering an excellent experience. Contact us today to reserve a storage unit in Modesto! Best place to storage your stuff at. Amazing prices! The staff there are super friendly! I forgot my code. The manager was standing right next to the code box on his day off. He said he couldn't help me with my code because he is off work.but stands there staring at me so I won't tailgate. I found the manager to be very rude. Awesome customer service. Thank you! Very professional. Never any problems. Felt very secure using this self storage. Highly recommend this place. If storage is needed in the future, will definitely come back! Excellent customer service. Friendly staff. Answers questions promptly. Will definitely use them again in the future. We have rented from Extra Space Storage twice now, and have never had a security or other issue. But they constantly raise your price. It feels like they WANT you to MOVE OUT! So if you are looking for long term storage, definitely not the place, as you never know what your cost will be in even 6 months. Great customer service friendly staff. Respected understood greeted felt welcome answered all questions I had for them. Easy access and great prices and deals. Great experience. Overall was a wonderful customer service experience. Very knowledgeable in their business. We were treated with respect and that was a big plus. Very clean well maintained buildings lots of space to park to unload your items isles between buildings is wide to be able to get your large items into the storage rooms. Security cameras every where to keep an eye on the buildings and your things. Security is very well thought out makes me feel safe. I will use them any time I have the need to store anything. Plus they offer a free move in truck! The staff is great and very helpful, friendly and they care about there work and customers. When I first seen that the first month was free I got really excited. I signed up for a storage unit online. I received a phone call right away and set up and appointment to find out that the first month really was not free because you had to pay other fees. But overall the men that work in the main office are very nice even after I gave them attitude because I was upset they were still very kind and friendly. We really enjoy doing business with the facility at Crows Landing. The manager is friendly, helpful and very business oriented. The grounds and units are keep neat and clean which is a very good selling point and the facility has good security which is always important when you have use use storage units. Very nice managers, facility is kept clean, overall great !! Very clean. Gated and well secured. Very affordable. Convenient security key pad. I don't have to get out of my car as the entrance key pad is easily accessed through my driver side window. Surveillance makes me feel my stuff is secure, great custumer service. We were relocating and there were so many things going on at once. The last thing I needed was another headache. Bob and Jose made my move in seemless. No hassle and recommended the right size for my needs. I would definitely recommend this to anyone who's about to go through the same thing I did. They take pride in there work. Recently I was in need of a storage locker for my father's belongings. We had to put him in assisted living and we needed to find a local storage company to accomodate our needs. We had visited the Extra Space on Crowslanding Rd and were treated with understanding and made to feel very welcome. The staff worked with me and gave me a great deal on a storage unit. I want to thank Extra Space for having such wonderful employees who put the customer first. From the moment we walked in the office, we could see the difference. We were greeted and treated like a guest vs just a customer. Visited several sites in the area and the prices were Great here, you definately get more bang for your buck! , security is state of the art and the customer service stands alone. Will difinately will refer friends and family to get our $50 referral discount! We were relocating and there were so many things going on at once. The last thing I needed was another headache. the staff, made my move in seamless. No hassle and recommended the right size for my needs. I would definitely recommend this to anyone who's about to go through the same thing I did. Your employees are always very helpful. The facility is always very clean and the security is 100% secure. I have recommended this facility and even a cousin used it. keep your rate increase to maybe once a year not ever 5 months. I am really pleased with this facility. My unit is safe from break-ins and it is close enough to the office that should I need help for whatever reason, the owner and/or someone would be available to help me. I live a couple hours from Modesto, and I have never had to worry about anything to date, and, I believe I am going on year number 10 now with the facility. Extra Space is the best storage center that I have stored with so far. This facility is amazing all around! People think that because its Crows Landing Rd. Its a "bad" area, this truely is false, there is top notch security, the facility is super clean and Bob and Jose are great and will help you out! Exit off HWY 99 Crowslanding before you hit Whitmore/Crowslanding Exit off HWY 99. Next to John Deer Tractor and Jack in the Box. We are in between the Arco AM/PM and the Crows Landing Road Vet Clinic. We are close to the Belkorp Ag store (with the tractors out front). From Hwy 99 going south take Crows Landing Road exit. Head south on Crows Landing Rd. Approx. 3 miles. Extra Space Storage will be on the right side of the street before you get to the stop light at Whitmore Ave.
We are in between the Arco AM/PM and the Crows Landing Road Vet Clinic. We are close to the Belkorp Ag store (with the tractors out front). From Hwy 99 going North take Crows Landing Road exit. Turn Left at the stop sign. Head south on Crows Landing Rd. Approx. 3 miles. Extra Space Storage will be on the right side of the street before you get to the stop light at Whitmore Ave.
We are in between the Arco AM/PM and the Crows Landing Road Vet Clinic. We are close to the Belkorp Ag store (with the tractors out front). From Hwy 132W go to D St. Turn left on D St. Follow to 9th St. Turn Left go to B St. Turn right follow to Crows Landing Rd. Turn Left.Follow over overpass go to 2201 Crows Landing Rd. Property is on right side of street. We are in between the Arco AM/PM and the Crows Landing Road Vet Clinic. We are close to the Belkorp Ag store (with the tractors out front). Take I-580 to I-205 to I-5 Northbound. Take Hwy 120 to Hwy 99 southbound. Follow Hwy 99 southbound to Crows Landing Rd. Exit. Take to 2201 Crows Landing Rd. Property is on right side of street.